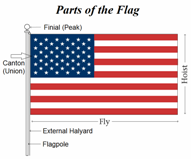 Facts and info about American Flag Holidays. The date of the American Flag Day is June 14 when the flag of the United States of America is displayed on all Government buildings and many private homes. The custom and tradition of flying flags to commemorate special people and significant events in US History plays a major role in the lives of Americans. American flag holidays are the dates and days designated for observing the traditions and customs related to the display of the American Flag as the official emblem of the United States. 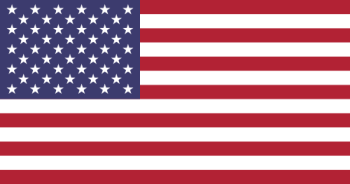 The American flag is always flown on US National holidays, State holidays and the birthdays of the US States (to commemorate their date of admission to the Union.) The President of the United States is also empowered to proclaim new days , dates and events as American flag holidays. The following chart contains details of the days, dates and significant events when the Stars and Stripes are flown, popularly referred to as American Flag Holidays. The following chart provides details of the days, dates and definitions of American Flag Holidays whose origins are not immediately evident and might require further clarification by non-Americans. Check out the facts about American Flag Holidays. Commemorating the anniversary of the original adoption of the American Flag as the official emblem of the United States by the Continental Congress on June 14, 1777. Also called Fourth of July. Commemorating the adoption in 1776 of the Declaration of Independence. Holidays Columbus Day, 2nd Monday in Oct. Formerly called Armistice Day to commemorate of the end of World War I and in honor of all veterans of the armed forces. When is National Flag Day? 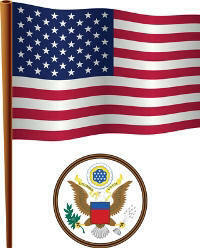 The date is always designated as June 14, the birthday of the first official US emblem. Although it is not a Federal holiday, the American people continue to honor the history and heritage it represents increasing patriotism throughout the US. The days of the week it is observed changes from year to year according to the calendar. The following table details the days it will fall on each year - check out . Patriotic and national observances - Learn about American Flag Holidays and vacations!